Friedrich Ludwig his wife, Marie Margarethe, their sons Carl and Louis left their home in Langenbach, which was located in the Province of Hachenburg in the dukedom of Nassau in the fall of 1845. Traveling with the family was Ludwig’s brother, Johann Peter Schütz. This small group traveled to Antwerp to board the ship Harriet that was set to sail on 31 October. Before boarding, Ludwig and Peter signed an Einwanderungs Vertrag or Immigration contract with the Verein Zum Schutze deutscher Einwanderer in Texas, Protection of German Immigrants in Texas. By signing the contract, Ludwig, as a married man, was entitled to 640 acres of land and Peter, an unmarried man, was entitled to 320 acres in the Fisher Miller Grant. For a fee the Verein made arrangements for the sea voyage, land transportation upon arrival, food, housing, grain and implements. The Verein also promised to provide churches and school for the settlers in their new settlement. The voyage to Texas lasted two months. Not only did the Schuetz family face the hardships of traveling across the Atlantic Ocean, they also faced the death of their son Louis who was buried at sea. In Maria Margarethe Hild Schuetz’s obituary which was published in the Neu Braunfelser Zeitung on 17 November 1904, it was stated “…[Maria] came in 1845 with her husband under the auspices of the Adelsverein to Texas. On December 27, they landed in Galveston and then from there they went to Indianola where they stayed about 8 days.” From Indianola the family traveled in oxen-drawn wagons. They made overnight stops in Agua Dulce, McCoy’s Creek, Gonzales, Seguin and finally to the new village of New Braunfels. The Schütz family learned that the land in the Fisher-Miller Grant was unsafe for settlers because it was located in Comanche territory. The family stayed in New Braunfels and Ludwig worked as a laborer. In 1848 Ludwig and Peter were issued certificates for the land in the Fisher Miller Grant but the family decided to stay in New Braunfels. By this time Peter had died and the family had increased. Theodore, a daughter, was born 24 July 1847. Three years later their last child, Wilhelm “William”, was born on 24 May 1850. Ludwig supported his new homeland. In 1849 he signed a document stating his intention to become a citizen of the United States and that his name was Friedrich Ludwig Schütz. He became a naturalized citizen in 1851. In 1847 the Verein was out of money and did not built the churches and schools as promised. So in 1850, the First Protestant Church of New Braunfels was organized by 136 heads of households of which Ludwig was one. Each signer agreed: “We obligate ourselves willing to bring an annual contribution in amounts as set by the church council in order to allot our pastor a reasonable salary and for the present contribute at least 50 cents quarterly into the treasury.” Eleven years later when the Civil War started, he chose to support the Confederacy and served in the 31st Brigade of Texas State Troops as a private in Company A. By the 1870s Ludwig and Marie were living on a farm in Blanco County near the Little Blanco River. In 1892 Ludwig, now called Louis, died at the age of 78 and was buried on the land where he lived. 52 Ancestors – #16: Which Willie, William or Wilhelm? Wilhelm Schuetz, the youngest child of Ludwig and Marie Margarethe Schütz, was born 24 May 1850 in New Braunfels. According to a family story Ludwig and Marie had a son, Wilhelm, who died before they came to Texas, so perhaps they were determined to have a son named Wilhelm. 25 March 1876, Wilhelm married Anna Kraft who was born 18 September 1859. In 1880 they are living next door to Ludwig and Marie probably, on the same property. Their name on the census was spelled Shute and they lived in Precinct 4 in Blanco County. Wilhelm and Anna had seven children: Willie, Alma, Emma, Hulda, Ottelia, Albert and Eddie. I remember meeting Ottelia and Eddie. Wilhelm died 21 Feb 1929 and Anna died 30 June 1936. Both are buried in the Twin Sisters Community Cemetery in Blanco County, Texas which is located on North 281 after you cross the Little Blanco River. Year: 1880; Census Place: Precinct 4, Blanco,Texas; Roll: 1291; Family History Film: 1255291; Page: 355C; Enumeration District: 026. Travis County, Texas. Death Certificate 6652. (1929) William Schuetz. Austin. 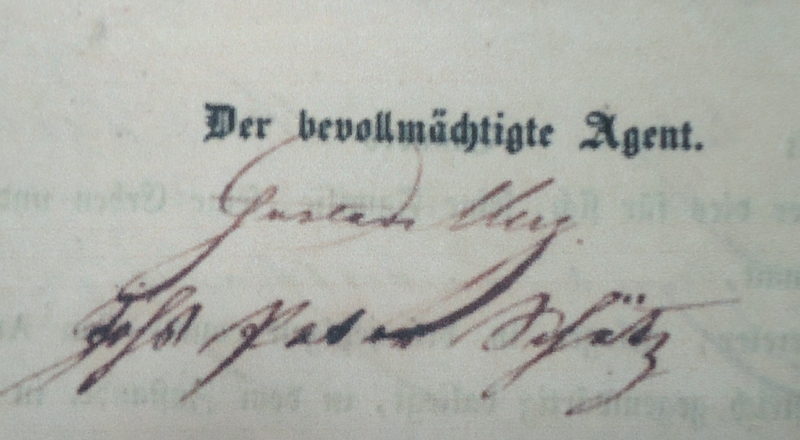 In 1845 Peter Schütz traveled to Texas with the Adelsverein and settled in New Braunfels, Texas. He sailed on the ship Harriet with his brother, Ludwig, and his wife, Marie Margarethe, and their two children. Great Aunt Annie Schuetz Saunders was the first one to tell me that Ludwig had a brother who traveled to Texas with him. She said he died after a few years because there was much sickness in Comal County. According to, Chester and Ethel Geue, the authors of A New Land Beckoned: German Immigration to Texas 1844-1847, Peter died in 1848. Peter, a single man over 17 years of age, was eligible for 320 acres of land in the Fisher Miller Grant of which he was entitled to receive 160 acres. In the Texas General Land Office the original document signed by Peter is digitized and can be viewed online at http://www.glo.texas.gov. Click on Land Grants and type Schütz in the name box. Geue, Chester and Ethel. A New Land Beckoned: German Immigration to Texas 1844-1847. Waco, TX: Texian Press, 1966. Personal Interview. Annie Schuetz Saunders, 1970. “Schütz, Johann Peter.” Texas General Land Office. http://www.glo.texas.gov. 6 April 2014. When Connie Schneider Krause graciously shared her translation of the obituary of Maria Margarethe Hild Schuetz with me I was so excited! I knew so very little about this grandmother who came from Nassau in 1845. One time I asked my Grandma Lillie if she had any memories of her great- grandmother. She would have died when Grandma was about nine years old. She had a very vivid memory. Grandma told me her great-grandmother always wore an apron with a pocket. Whenever the grandchildren came around she would reach into her pocket and bring out a piece of hard candy for each child. Maria Margarethe had a total of six children, three living to adulthood, Carl my, great-great grandfather, Theodore “Dora” born in 1847, and Wilhelm born in 1853. She died at the ripe age of 96 years and 11 months on 4 November 1904. This is my favorite quote from her obituary “The deceased was vigorous for her age; she could still read and do needlework without glasses. She was respected and loved by all those that knew her.” She sounds delightful! Thank you Connie Schneider Krause for translating and sharing this obituary with me. “Maria Margarethe Hild Schuetz.” obituary. New Braunfelser Zeitung (New Braunfels), 17 November 1904, sect. C, p 4; translated from German by Connie Schneider Krause. “Ludwig Schuetz” Sophienburg Museum and Archives, New Braunfels, Texas. Personal Interview. Lille Schuetz Adam, 1970. Every day online records are being transcribed by volunteers to help family researchers. This saves time for the researcher and is very helpful when searching for ancestors who moved around a lot. The handwriting on many of the documents is difficult to read. Looking at census records for my great-grandfather, Henry Schuetz, I found several spelling variations of his last name. When his father Carl came from Germany, he spelled his last name Schütz. Just to illustrate how difficult the handwriting can be, here are the spellings I found for his name from the transcribed census records from 1940 to 1870. Name spellings can make researching your family interesting and challenging! The e and u caused a little trouble for the transcribers. So what did I find out about Henry from the census records? He was the second oldest son of Charles (Carl) and Catharina Schütz and was born in Texas. In 1870, the family lived in Precinct No. 1 in Blanco County, Texas. In 1880, the Schutz family is living in Precinct No. 4 in Blanco County. Henry is 16 and a farm laborer along with his older brother Willie. There are now 10 children in the family. By 1900 he is married to Emma, is 36 years old, was born in December 1863, a farmer, still living in Precinct No. 4 in Blanco County and has three children, Alex, Lillie, and Harry. Henry and Emma have been married for 11 years. In 1910 he is 45 and has been married for 20 years. The family speaks English. He has three living children out of four and is a self-employed farmer. His father Charley is living with them. He is 71 years old and widowed. The family has moved and are living in Precinct #3 in Kendall County. In 1920 Henry is 55, owns his farm and ranch. His youngest son, Harry, is the only child living at home with him and his wife Emma. Harry’s occupation is farm helper. They are living in Precinct #1 in Kendall County and all three can read and write. In 1930 Henry is widowed and 65. Harry, a World War veteran, is living with him in Precinct #1 in Kendall County. In 1940 Henry is 75, owns his farm, had 4 years of elementary schooling, and is a farmer “working on his own account.” His son Harry, age 41, is living with him. In 1935 they were living at the same address. The week before the census was taken both had worked 48 hours on the farm and in 1939 they each worked 52 weeks. Harry had 6 years of schooling and is a farmer. Despite the name variations, I found quite a bit of information about Henry Schuetz. Year: 1870; Census Place: Precinct 1, Blanco, Texas; Roll: M593_1576; Page: 354A; Image: 13; Family History Library Film: 553075. Year: 1880; Census Place: Precinct 4, Blanco, Texas; Roll: 1291; Family History Film: 1255291; Page: 353D; Enumeration District: 026. Year: 1910; Census Place: Justice Precinct 3, Kendall, Texas; Roll: T624_1570; Page: 4A; Enumeration District: 0159; FHL microfilm: 1375583. Year: 1920; Census Place: Justice Precinct 1, Kendall, Texas; Roll: T625_1821; Page: 6B; Enumeration District: 167; Image: 461. Year: 1930; Census Place: Precinct 1, Kendall, Texas; Roll: 2364; Page: 2A; Enumeration District: 0002; Image: 459.0; FHL microfilm: 2342098. Year: 1940; Census Place: , Kendall, Texas; Roll: T627_4086; Page: 11B; Enumeration District: 130-2. Residence no. Kendalia, Voting Precinct No. 3, P.O. Address Kendalia, Have lived at said place 9 years. I, Joe Saunders, Tax Collector aforesaid, hereby certify that the foregoing registrant personally signed and swore to the facts set out in the above receipt before me, showing her to be a qualified voter in primary election in said county, state and precinct for the year 1918. A. Elizabeth Taylor, “WOMAN SUFFRAGE,” Handbook of Texas Online (http://www.tshaonline.org/handbook/online/articles/viw01), accessed March 05, 2014. Uploaded on August 31, 2010. Published by the Texas State Historical Association. “Emma Schuetz” Kendall County Texas Voter Registration Receipt. No. 16, 5 July 1918.